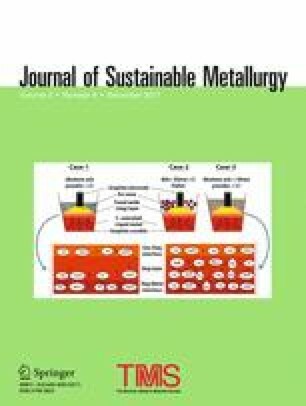 Recovery of antimony oxide for use in flame retardants from lead refining residues is evaluated using a fuming approach. A process is designed bottom-up. First, thermochemical calculations are made to determine process boundaries for a fuming process. Hence, a fuming model is created based on activity and vapor pressure data from literature, which is practically investigated using synthetic slag mixtures to describe fuming behavior in the binary Sb2O3–PbO system. The model shows that drosses can not be used in fuming process in their raw form but have to be preconditioned by the reduction of lead oxide. Preconditioning is investigated to define the best parameters in terms of selectivity and antimony enrichment in the oxide phase. The project upon which this publication is based was funded by the German Federal Ministry of Education and Research (BMBF) under Project Number 03X3592. This publication reflects the views of the authors only.